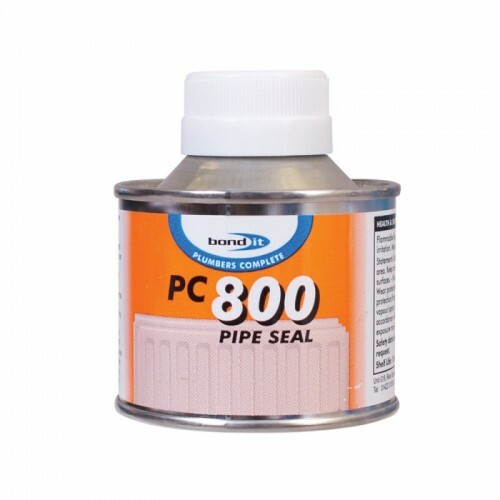 Used for jointing rigid uPVC water pipes. It is also suitable for many applications in the construction industry such as jointing PVC rainwater and drainage systems. Before jointing, the pipe fittings should be checked for position and alignment, both being marked to ensure assembly in the correct position. Preparation: Pipe ends should be smooth and square. Thoroughly clean the pipe end and socket with a cleaning fluid. 1. Cut pipe squarely and remove swarf from inner and outer edges and lightly chamfer outer edge. 2. Lightly abrade pipe and socket with an emery cloth then de-grease with fresh absorbent paper soaked in MEK cleaning fluid. 3. Using the brush applicator, quickly apply an even and generous coating of adhesive to the pipe in a lengthways direction and a similar but thinner coat to the fitting. 4. Immediately push together to the full depth, without twisting. Hold in place for 20-30 seconds then clean off excess adhesive. 5. Allow at least 10 minutes before handling and a further 8 hours before putting into service. 6. Reseal tin immediately after use.